Today's blog is not a review... it is more of a monologue about a pivotal moment in my scented journey through life - a life changing experience - so I beg that you please indulge me. Guerlain has been one of those houses that I have grossly misunderstood. Years ago, whilst working in the industry as a fledgling sales assistant I was uninterested with their perfume portfolio; back then favouring the likes of Azzaro Chrome and D&G Homme over Mitsuoko and Shalimar. "Stuffy and uninteresting" I had proclaimed, with an smarminess that now makes me wince. In the ensuing years however, and with increased exposure to a varied array of scents, I learned to broaden my horizons and came to truly understand that hindsight is indeed, 20/20. 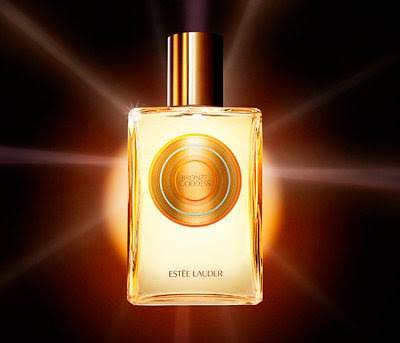 This being said, I have never been really enchanted by any Guerlain release. I had sampled their standard range in downtown doors, but never actively sought after the rare blends and discontinued gems that many people spoke of. Pourquoi??! I hear you ask... well, basically because nothing I tried had ever really knocked me off my feet. I figured 'Guerlain' an industry buzzword which only fuelled my desire to rebel! I don't know exactly at which point my perspectives shifted with regard to this perfume house. Perhaps it was a surprising encounter with someone wearing the stirring L'Heure Bleu at a dinner party... or maybe it was whilst browsing this website: a virtual museum built by a Danish man out of adoration and passion for Guerlain and their scented masterpieces. Whatever the case, it was enough to re-ignite my interest. 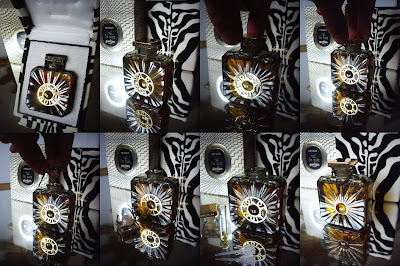 Within a couple of weeks, I came upon a stunning 30ml sealed bottle of vintage Vol de Nuit Extrait on the web, and after much deliberation (and quite unnecessary peer-pressure!) decided it would be mine. A blind buy of epic proportions! The package arrived in the mail yesterday and I scooped it from my doorstep like Moses from the 'rushes. I literally heard angels trumpet and a choir of celestial voices. 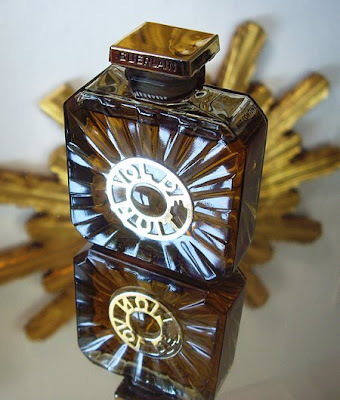 I mean, I had he-ooge expectations... it was Guerlain, it was vintage, it was extrait, and it was $225! I was going to love it, by jingoes! I spent a good part of the afternoon turning the wonderful 1960's zig-zag and zebra stripe packaging over in my hands, and photographing the stunning glass flacon. I tugged at the ageing thread that held the seal intact, wondering how I might succeed in opening it with a minimum of damage. I sniffed at the tight neck of the bottle and got nothing but a small dent in my nose that faded rapidly from white to pink. I looked at the receipt for my purchase with a frown... yes, I was going to love it. Wasn't I? I found myself staring at the bedroom ceiling at 4am whilst the crickets chirruped outside my window. So today was the big day. I thought it rather peculiar that I drank my morning coffee with butterfiles in my stomach; my eyes never really losing sight of the box sitting on my desk. I felt giddy with anticipation, despite having had no sleep, and looking as though I'd been dragged 100 yards under a bus. But with trembling hands, I removed the flacon from its packaging and carefully trimmed the cord holding its stopper in place. I gave it a tug. I put the bottle in the fridge and went and had a lie-down, feeling as if the world had conspired against me. 45 minutes later I was back at my desk with bottle in hand. I could feel that the stopper had shrunk slightly, so I gave it a gentle twist. The stopper lifted and the seal let out a soft hiss as the perfumed air escaped for the first time in almost 50 years. I pressed the moist glass stopper to my wrist, waited a few moments and inhaled. I lingered for many seconds... bitter green, opulent jasmine, galbanum, dark woods: and then an unanticipated feeling of boundless beauty and of overwhelming sadness. I felt as though the Vol de Nuit was telling me a story in whispers from behind a cupped hand held over my heart. I was no longer conscious of individual perfume accords - instead I experienced something way more poetic... something monumental. It was a perfume narrative, and the experience almost bought me to tears. I recalled the otherworldly 'sigh' I had heard when opening the bottle for the first time, and felt for a moment as if I'd liberated a genie from her lantern... perhaps one that was lamenting a love lost over the ages; her passion and sorrow swelling on the air. Such love! Such beauty! And such despair! I replaced the stopper and sat back in my chair for a while, allowing the narrative to tell me of winsomeness and woe, all in striking colour. Never before have I been moved by a perfume in the same way as I have today. As cheesy as it might sound, I feel as though I have crossed some threshold and stepped into a whole new state of consciousness, and it was this vintage Vol de Nuit extrait that held the door open. I don't know if I just got lucky, or indeed if many of Jacques Guerlain's creations are as absorbing as this one. What I do know, however, is that I will never look at this house, or at perfumery in general in the same way again. 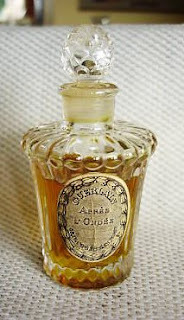 Few fragrances seem to excite me more than Olivier Durbano's Parfum de Pierres Poèmes. As reported earlier, the French jeweller/perfumer has just launched Turquoise - his fifth in a series of seven perfumes inspired by semi-precious gems. Touted to be an "ozonic" style fragrance, I can admit to having had some initial reservations. Ozonic scents à la Comptoir Sud Pacifique's Aqua Motu and Kenzo Pour Homme have not done much for me. Certainly a dull synthesis of ozonic molecules will sell hand over fist on the mainstream market, but these releases are simply not my bag. The ability to find an ozonic scent with true substance had eluded me for years - until today. Any ideas you might have about oceanic cologne clichés - you can throw them out the window... and don't be fooled into thinking that Turquoise is the olfactory equivalent of a recreational trip to the oxygen bar. Durbano has masterfully translated a vast spiritual history of the stone into perfume... acknowledging the ancients who revered this gem as "fossilised water" or "fragments of the sky". Turquoise is very much grounded; natural; elemental. Durbano's perfume creations are referred to as "stone poems", after all. Turquoise opens with a lustrous accord of elemi which is both lemony and pine-like... it is fleeting, though the resinous quality of this component lingers over green coriander and a very fragrant juniper. Already one's mind begins to conjure images of sprawling forests of fragrant conifers... a vista in the wilds of North America, perhaps. As the scent evolves, one can begin to determine a faint penetrating sharpness that lends a mineral-like quality - one that I would associate with the intriguing 'turpentine' accord listed in the topnotes. Also much to my delight, I recognise the signature Durbano frankincense note; one common to 4 of the 5 pierre de poèmes. This Somalian oliban is husky and almost orange-like - suggestive of weathered stone and earth. The heart of the perfume is focused on lotus flower and fucus seaweed... each of these bring an dewy, wet characteristic to the scent. The allusions to water are in striking contrast to the earthy, resinous topnotes, and I find myself thinking of shorelines where sun-heated stones meet cold snaking rivers; the clean mountain air damp with evaporation. It is this clever contrast between the two elements that makes Turquoise such an accomplished and inspired creation. Myrrh and ambergris provide the foundation for the perfume and again, represent a curious marriage between earthy and marine accords. The innovative balance that has been achieved throughout is where Turquoise's success lies... it represents the stone in its raw form, just as it has been struck from the earth: bottomless oceans of blue juxtaposed against raw and jagged stone. 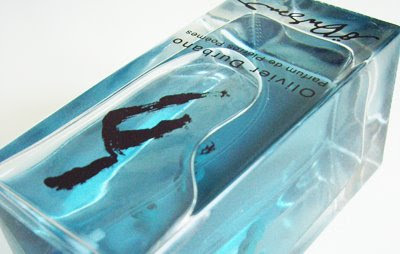 Turquoise is a genderless eau de parfum, and has above-average persistence. It can be ordered direct from Olivier Durbano's studio in Paris, and will also be rolling out to his regular retail stockists soon.